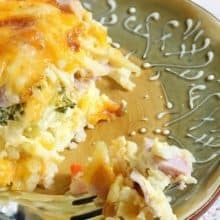 Simple, Easy Hash Brown Casserole. Perfect for lazy Sunday mornings or holiday breakfasts! Take your bag of still frozen hashbrowns and crack in an egg. If you want, you can add another one to make it slightly more eggy-ish. Mix in the egg and some seasoning salt, 1 tsp or so. Slice your bacon up and throw it into a frying pan to sizzle. While your bacon is cooking, press your hashbrown mixture into a well greased 9x13 pan. Bake at 400 degrees for about 20 minutes, until it's beautifully browned. Drain your now done bacon. Mix the mushrooms, bacon and green onions in a large bowl. Crack in 7 eggs, the milk and add the shredded cheese, mix together. So after the 20 minutes in the oven, the hash brown crust should look golden brown. Bake for about 15- 20 minutes in the 400 degree oven, until the eggs are cooked. Slice in squares and serve.